Krishnanattam is a modified form of Ashtapadiattom. It was evolved by the then Zamorin named Manavedan. The theme is obtained from the story of Lord Krishna which is obtained from the text Krishna Geetha written in Sanskrit by Manaveda. The whole dance is performed as 8 parts conducted on 8 days and the eight plays needed for the complete presentation includes Avataram, Kaliya mardanam, Rasakrida, Kamsa vadham, Swayamvaram, Bana yuddham, Vividavadham and Swargarohanam . Beautiful dance performances are conducted on these 8 nights. The actors are very good in expressing mimics. There are musicians to sing the songs for the story. Krishnanattam is conducted from Guruvayoor under the management of Guruvayoor Devaswom. This dance form is greatly influenced by the folk dances Theyyam, Mudiyattom etc. So the makeup, costumes, masks used, head dresses, all are influenced by these folk dances. The costume of Krishna was designed by a Krishna devotee named Vilwamangalam. The characters use face masks which are made of wood. The priority is always given to the dance form and it is performed in groups and the importance is given for the group compositions. It involves several characters which play the dance with same expressions, eye movements, gestures and with full co-ordination. The instruments used in this dance are the Maddalam, Elathalam and Chengala. The dance begins in the evening with a Kelikottu which is played by using various instruments from the East door of the temple. It indicates that the performance is scheduled at night. At dusk the actors become busy engaged in putting makeup from a room where a lamp is lit. It is conducted after the prayers and rituals in the temple get over and when the sacred place where the idol of God is kept is closed. Then a lighted lamp is kept in the stage where the dance is conducted. This lamp called as the Kali Vilakku is lit from the lamp which is lit inside the makeup room. Then the musical instruments are played for sometime after which a cloth screen is held in the stage behind the Kali Vilakku. The women actors who perform on that day conduct a prayer dance called Totayam. This is to receive the blessings from God. This performance is not for the audience. Every day the performance begins with an auspicious beginning. The Totayam is followed by Purappatu which involves dance performance. 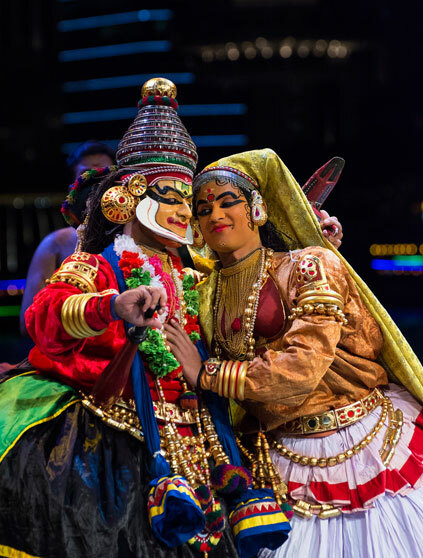 The characters for the play include Krishna, Balarama and various other characters.